Edda is a modern early season purple plum, developed in Norway specifically for northern climates. It is juicy and has a good flavour for eating fresh and for cooking. Edda can be considered an improved form of the popular and reliable 19th century Czar variety, which is one of its parents, and is in turn descended from Rivers' Early Prolific. It therefore makes a good choice if you are looking for a reliable plum to plant in less than perfect conditions. Please fill in the details below and we will let you know when Edda plum trees are back in stock. Czar is a traditional culinary plum, one of the easiest plums trees, will even fruit on north-facing walls. Herman is one of the best quality early-season plum varieties, blue/purple with yellow flesh. 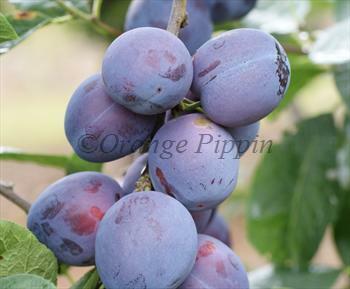 Opal is an early plum variety with a good flavour, self-fertile and very easy to grow. Early Prolific is a very heavy-cropping early-season plum, raised by the famous Rivers nursery. Edda is in flowering group 2. Edda is self-sterile and needs to be pollinated by another tree of a different variety nearby. Edda is a reliable cropping variety. Picking time is late July in southern England. Edda is grown commercially in Norway, along with Opal and Victoria - both of which are good pollinators for it. It is not as high-yielding as its ancestors, Czar and Rivers Early Prolific, which is one of the reasons for its improved flavour. Developed at the State Experimental Station, Njos, near Oslo in southern Norway. Introduced in the 1970s. It is a cross between Czar and Prune Peche.